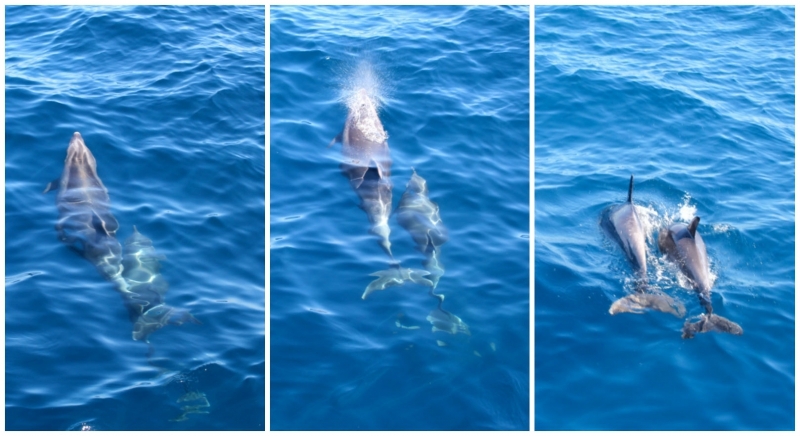 If you are visiting Marbella, you have to go to the beautiful beaches of Tarifa and you have to go dolphin and whale watching with Aventura Marina - what an experience! 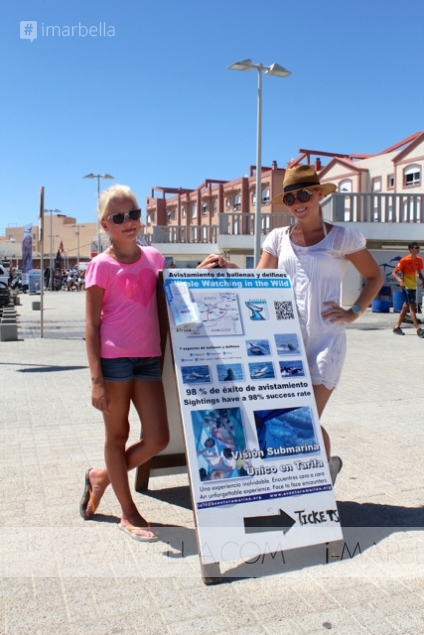 After arriving to Aventura Marina’s office in Tarifa port, a biologist explained about the species and different dolphins and whales we were about to see. Did you know Aventura Marina was founded in 1997 in order to promote eco-tourism, and to preserve the richness of the fauna in our coasts as much as possible, in particular the marina mammals, dolphins and whales! They also collect data during the tours to research on the mammals habitat and on the groups of whales and dolphins that live or travel along the strait. After the biologist explanation we headed to the boat, which was a catamaran provided with underwater vision. Also this boat do not use propellers, so they don’t disturb or harm the animals. As we got further and further away from Tarifa port we started to look for the animals. The first ones we spotted were the Striped Dolphins, that are around 1,5-25, metres. They kept on coming closer to the boat, and jumping in and out of water. Beautiful creatures! And they seem so friendly! 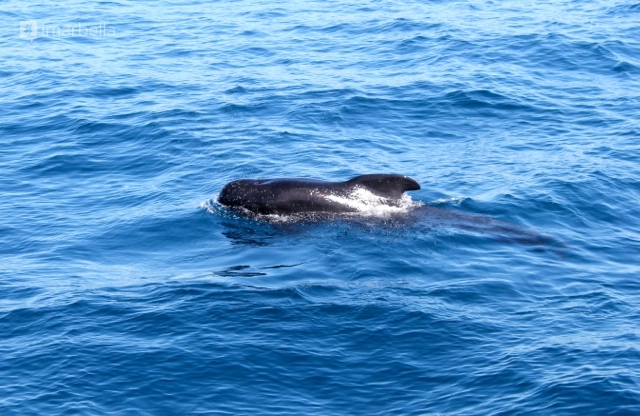 The further we went to Morocco, we started seeing being mammals - the Pilot Whales, that are about 4-6 metres long. Wow, this was something special. They were enormous and yet not intimidating at all. And there were also Bottle Nose Dolphins around them, so they all were playing and jumping together. The bottle nose dolphin is about 2-3,5 metres long and that is what people know from the famous TV show - Flipper. 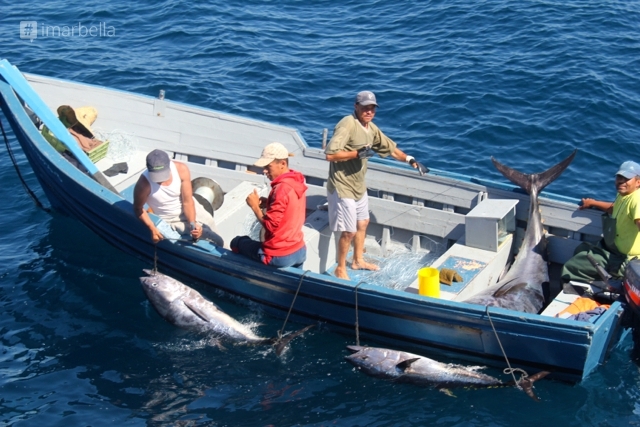 Another thing that was incredible to see was the Moroccan fishermen with huge tuna fish in their boats! Since we were also looking for Orcas, killer whales, the staff asked the fishermen if they have seen any that day. Why do they ask the fishermen? Because the Orcas steal the tuna fish from them instead of hunting it themselves, since its much easier. And then they spread the word and “tell” others you have this option of a free lunch there! Amazing animals! Forget about aqua parks and dolphin shows in zoos, this trip is something special - seeing the dolphins and whales swimming in the open sea and playing with each other is something almost like a miracle, like from a movie! And it is only one hour drive from Marbella and Aventura Marina guarantees you will see some species on their trips, otherwise they will give you a free ticket. And they definitely kept their promise! Plus the whole staff is super friendly, explaining constantly which species you’re seeing and also they speak several languages, so you don’t have to speak Spanish to understand. I really recommend you to go at least once in your life to this kind of trip, it really was a real adventure!